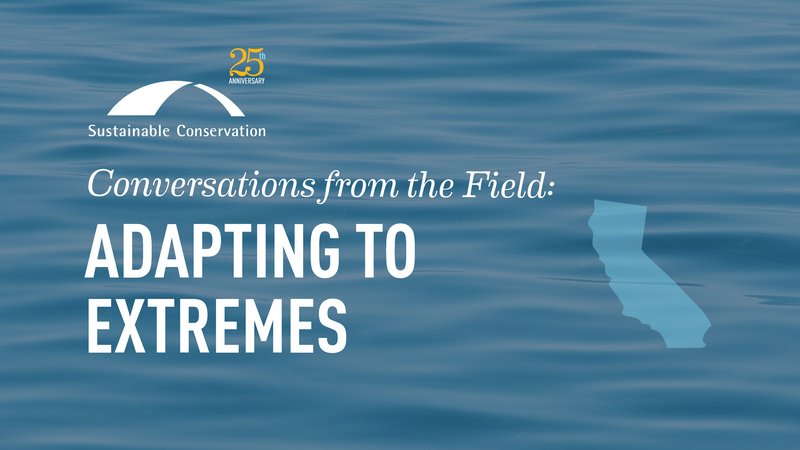 Missed the live stream of our thought-leader panel, Conversations From the Field: Adapting to Extremes? Click below to hear diverse experts explore on-the-ground strategies for managing California’s rivers and runoff to protect human health, safety, and a sustainable water supply for people, wildlife and our economy. Ashley has directed the strategy, growth and operations of Sustainable Conservation since 1997. Ashley received a 2007 James Irvine Foundation Leadership Award for her unwavering commitment to innovative, balanced problem-solving to address a variety of critical environmental problems facing California. Prior to Sustainable Conservation, Ashley spent eight years at Smith & Hawken, a mail order and retail gardening company, where she worked in finance, new business development, inventory planning and retail merchandising. She began her career at The Nature Conservancy in program development and fundraising. In addition to her work at Sustainable Conservation, Ashley serves on the California State Board of Food and Agriculture, on UC California’s President’s Advisory Commission on Agriculture and Natural Resources, and on the Executive Committee of the Agricultural Sustainability Institute’s External Advisory Board at UC Davis. Ashley served on the Board of the Robert and Patricia Switzer Foundation from 2002 to 2011, the last two years as Chair, and on Stanford Business School’s Alumni Consulting Team Board from 1995 to 2002, the last three years as Chair. Ashley is a graduate of the Marlborough School in Los Angeles, which awarded her their 2008 Woman of the Year Award, and has a BA in human biology, an MA in applied economics and an MBA from Stanford University. Curtis has worked for California Trout since 2000 heading up the Mt. Shasta Office before becoming Conservation Director in 2010. In 2014, Curtis was named Executive Director where he currently leads CalTrout’s work to solve complex resources issues while balancing the needs of wild fish and people. Curtis’ work with CalTrout has included leading projects on the Klamath, Shasta, McCloud, Upper Sacramento, Pit Rivers and Hat Creek. California Trout owns property on Fall River and the Upper Sacramento River that Curtis managed for public access, environmental education, and donor functions. As Conservation Director, Curtis led CalTrout’s statewide policy and legislative working with CalTrout Conservation staff and Sacramento based political consultants. From 1996-2000 worked for The Nature Conservancy at the McCloud River Preserve and as Project Ecologist for the Sacramento River Project. Curtis received a Master Degree in Fisheries Science from Utah State University in 1997. His thesis work was on the spawning and recruitment of adfluvial Bonneville cutthroat trout with an emphasis on early life-history. Ms. Nolan has a Bachelor of Science Degree in Civil Engineering from California Polytechnic State University, San Luis Obispo and a Master of Science Degree in Civil and Environmental Engineering from Stanford University. She is a licensed Professional Engineer in the State of California with over 17 years of experience in both the public and private sector and has worked for Madera Irrigation District for over eight years. Tim was appointed by the Governor in January 2012 to serve as a member of the Central Valley Flood Protection Board. Tim currently works for the San Francisco Public Utilities Commission as the manager of the Natural Resources and Lands Management Division. Previously, Tim spent six years working as the Assistant Secretary for Water Policy and Science at the California Resources Agency and as the Senior Policy Advisor and Deputy Director for Ecosystem Restoration at the California Bay-Delta Authority. Tim’s responsibilities included serving as the State Coordinator for the CALFED Bay-Delta Program, and he focused on river systems and the intersection of water supply, ecosystem restoration, water quality, flood protection, and agricultural issues. Before joining the State, Tim directed the Tuolumne River Preservation Trust’s Central Valley Program. Tim earned a M.S. in Civil and Environmental Engineering and a M.A. in Urban Planning from the University of California, Los Angeles, and he completed his graduate work at the University of California, Berkeley.